Right after Frida Kahlo divorced with Diego Rivera, she painted this self-portrait. 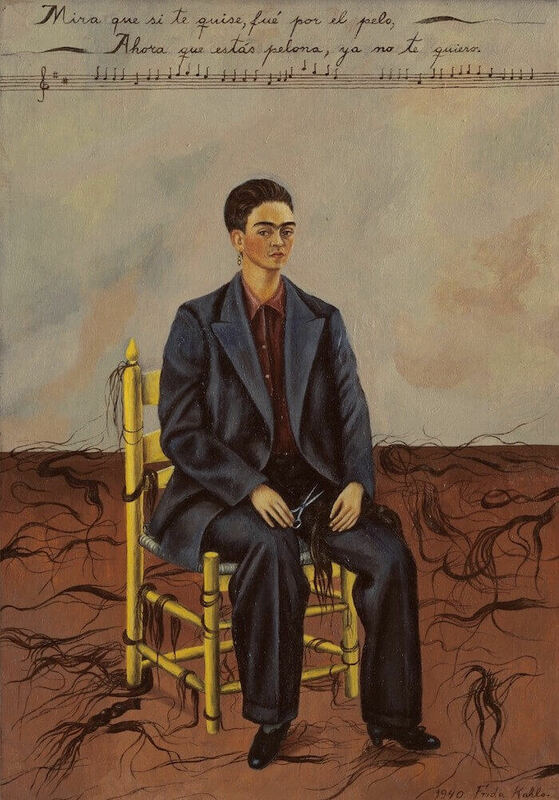 Unlike other previous self-portraits in which Frida always wear feminine dresses, in this one she was wearing a large suit of black color, which looks like one of Diego's. She also cut off her long hair, which has attracted Diego so much. She was holding scissor in her right hand which means she did it all by herself. In her left hand she was holding her shorn hair which is a symbol of her sacrifice. "See, if I loved you, it was for your hair, now you're bald, I don't love you any more.". After the separation with Diego, Frida choose to abandon her feminine image. She cut her hair shot, got rid of the Tehuana dress Diego is obsessed with and started to wear man's suit. The only thing she keeps as a feminine decoration is her earrings. This self-portrait expressed her desire to be independent and not relying on men.